Shhh! Seamstress Sophie is reading. I’ve been busy lately, not so much with needle and thread (though I am still working through my pile of doesn’t-fit-anymore clothes that I’m altering) but with a book!! Quite a while back, I put in an order on Amazon and grabbed me several books on sewing and fashion history. I haven’t yet had much time to look at all of them with the attention they deserve. Except this one. I just finished the 3rd novel in a row and thought it might be time to read something more useful. And so I opened “Couture Sewing Techniques”. And I am hooked! 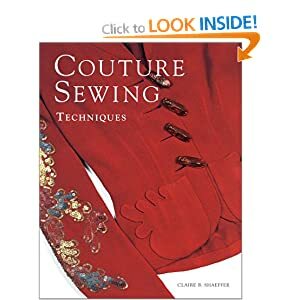 From chapter 1, it explains the craftsmanship, detailing and patience that goes into making a couture item, as well as what that means. Mentions of the Chambre Syndicale de la Couture do not go unnoticed, and the glory of the parisian couture houses shines again in print. I am just about to finish the second chapter, which talks about the various types of stitches. Hand stitches. A whole chapter on them. Mind-boggling…. So many needles, so many threads, tips and tricks on what to use when and how… Some things I’d mysteriously learnt from my granma (who wasn’t a seamstress… that I know of…) but most were new to me, and absolutely brilliant knowledge that I can almost immediately put to use on the pile of alterations and on the jacket I’m working on.